What is the inverter, and what's the use of it? The inverter is an electronic device which can convert low voltage (12V or 24V) DC into 220V AC. We usually rectify 220V AC into DC for use, but the use of the inverter is just on the contrary, so it is called “inverter”. 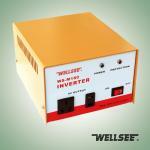 In the “mobile” time now, including the mobile office, mobile communication and mobile recreation, we don't only need the low voltage DC from batteries or storage batteries, but also need the indispensable 220V AC even more in our daily life, and the WELLSEE inverter can meet your need for this. 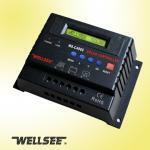 The types of inverters classified by different output waveforms? Classified by different output waveforms, inverters can be classified into three types: the square wave inverter, the modified wave inverter and the sine wave inverter. The square wave inverter outputs the poor-quality square wave alternating current with the positive maximum to negative maximum produced almost at the same time, so the current can cause severe uncertainty to the load and inverter itself. The modified wave inverter gets an interval between the positive maximum to negative maximum of output waveforms, so the effect is improved, but its waveforms are still composed by broken lines, and it belongs to the square wave domain without a fine sequence. The sine wave inverter outputs the sine alternating current that is same with our electrical network for everyday use or even better, which can drive any sort of load, and it does not have the electromagnetic pollution in the electric network.